It's based on all data until January 2015. 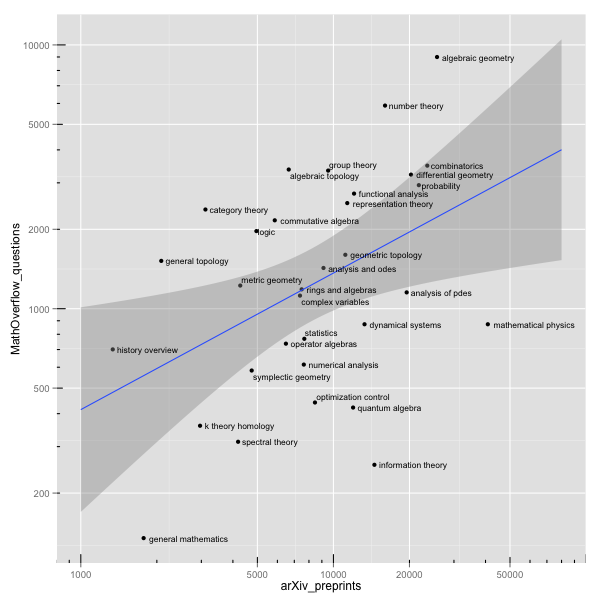 For MO there is little dependence of popularity of topics over time; for arXiv there is some, but it does not change the plot in any drastic way (due to arXiv growth the lifetime average is close the the average from the last 5 years). I am not a (real) mathematician, and not even a frequent MO user; so I may be missing some explanations, which are obvious for everyone in a given field. Do you know plausible explanations why certain fields lie above, or below, the regression line? Some subjects seem to draw more amateur-interest and also "idle curiosity" from professionals than others. (Number theory, foundational questions (logic/set-theory), questions on history come to mind, which are all over-represented and as Asaf remarked "logic" could have more questions on MO if just the tag was used). Some subjects are "fundamental" in the sense that researchers in another field might have use for some technical result and ask about it while they hardly would consider writing paper in that field. (General topology, and maybe category theory comes to mind.) Relatedly there are some subjects that are more common in graduate curricula than others. MO always was a bit biased towards more pure math (see the link by Steve Huntsman), and the relative lack of applied analysis is well-known. The existence of other sites as mentioned by Stefan Kohl (information theory, statistics, and mathematical physics might be affected by this, and in addition to the preceding point). Technical artifacts. Like, arXiv enforces one of those categories, MO does not, and (thus?) hardly anybody tags general mathematics while on arXiv it is sometimes used. Or, consistency and clarity of the use of the tag (e.g., algebraic geometry might benefit from this). It is hard to tell what is rationalization of the data, as I saw it; but I would have said some of the things even without the data. I guess that MO is more forgiving about discussing curious problems, or recreational mathematics, such as Stanleys question about certain chess positions for example. Problems which are easy to state without a lot of overhead are easier to post on MO, and more people can chip in on these. This might explain why discrete math (combinatorics) and algebraic geometry are prominent. Every mathematician know (or should know) what a graph, a permutation and what a polynomial is. Then number theory of course, draws attention for a similar reason; primes are understood by everyone and is a hot amateur mathematical topic. Same with logic, which attracts a lot of amateur mathematicians.